A couple of years ago, when we were making our Honey Jar Wedding Favours, I started to learn more about bees. What began as a quest to create unique gifts for our guests turned into a passion for helping our endangered pollinators. Over the last decade, beekeepers around the world have been reporting serious hive losses each year, as native pollinator populations continue to decline and hives collapse. A decline in the health and population of pollinators is a serious threat to our global food supply. At least 80% of the world’s crops rely on pollinators like bees and butterflies for reproduction and fertilization. There is not a meal that you eat that hasn’t been assisted by pollinators – from fruits and nuts to vegetables and herbs…even coffee and chocolate! Whether you live in the country or the city, you can help these dwindling populations. 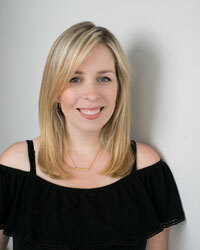 Here are 8 ways that you can make a difference right now! From fields and meadows to backyards and balconies, we can all find a space to grow bee and butterfly-friendly native wildflowers. These populations are declining mainly because of habitat loss. You can make a big difference by creating bee and butterfly friendly spaces in your garden. Even a small balcony planter is a great place for a pollinator in an urban area! 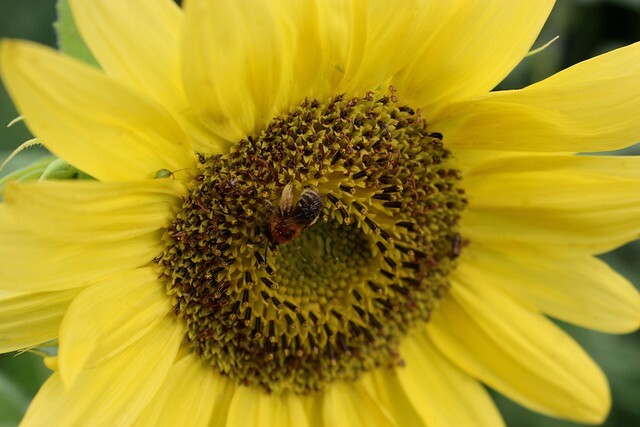 Bees love to live in cities where there are shorter flight paths and lots of variety of flowers. These little gardens can be an oasis for them and just as nice as being out in the country. 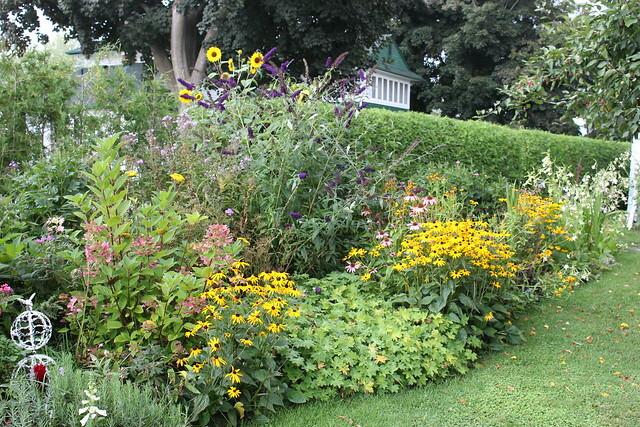 Grow native plants in different colours and shapes, and that bloom throughout the season (spring, summer and fall) to help give them variety. They’ll be thankful for the protein-rich pollen and energy-packed nectar! When we first bought Cloverhill last year, we had about a ¼ acre at the back that had previously been part of the farm field behind us. We didn’t know quite what we wanted to do with it yet, so we threw down some more red clover seeds and some wildflower seeds. The field was full of bees and butterflies all season. This year we planted even more wildflowers, along with our vegetable patch, to help out our friendly neighbourhood pollinators again…and you wouldn’t believe all the buzzing you can hear back there. They love it…and we love getting to see all the big bright blooms! Having all these pollinators has also been great for our vegetable patch. Each pumpkin and squash we have growing in our backyard right now is there because the bees helped us. 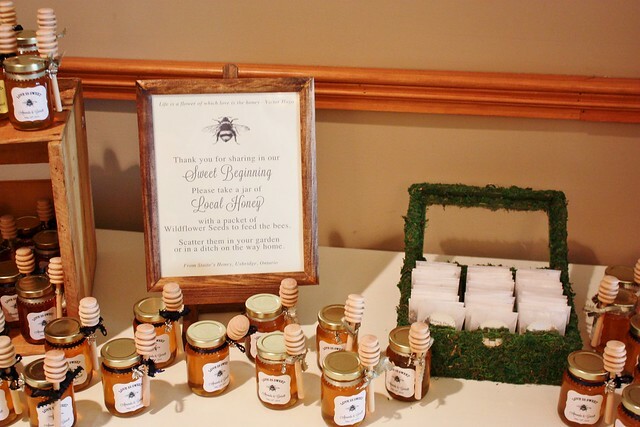 While I was learning about the bees before our wedding, I decided that if we were going to give away honey for our guests, we should give back something to the bees that made it too. I created DIY Honeybee Wildflower Seed Packets for guests to grab along with their jars. 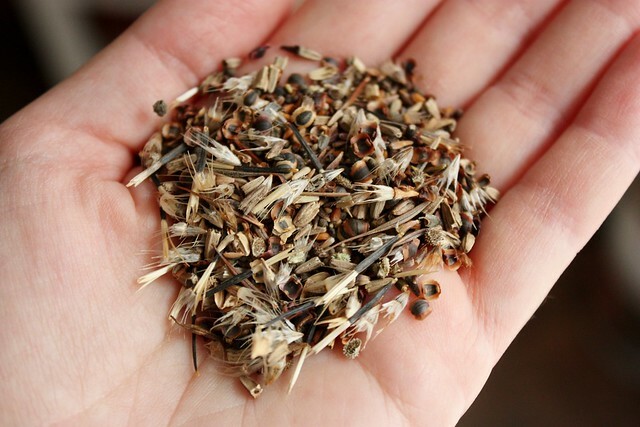 We encouraged guests to take the seeds to scatter their own garden or even in a ditch on the way home. Any extras we had, we took with us on our honeymoon road trip to scatter as we went or give to friends we met along the way. We joked that if anyone wanted to trace our trip route, they just needed to follow the wildflowers, ha! Local beekeepers help tend to the bees and keep a close eye on dwindling populations. Buying local honey and using it as gifts and favours is a great way to support them. We made DIY Honey Jar Favours for our wedding, but they’d be great for showers, birthday parties or corporate events as well. 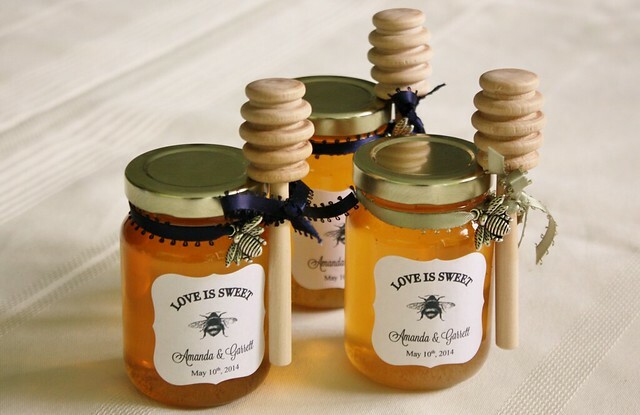 Whether you make the jars up yourself or have them jarred for you, it’s a great way to support our beekeepers and give your guests a sweet gift! The monarch butterfly population has declined by 90% in the last twenty years and one of the main causes is the lack of milkweed, which is the only plant they can make their cocoons on. Without this crucial plant, they cannot complete their lifecycle and turn into butterflies. You can plant milkweed in your yard and give them a safe place to turn into beautiful butterflies for you to enjoy too. Don’t forget to plant nectar-rich flowers to bloom late in the summer too – and help them fill up for their long flight to escape winter in Mexico! Pollinators are crucial to helping your fruits and vegetables, but when the crops stop blooming, they can run out of a food source. 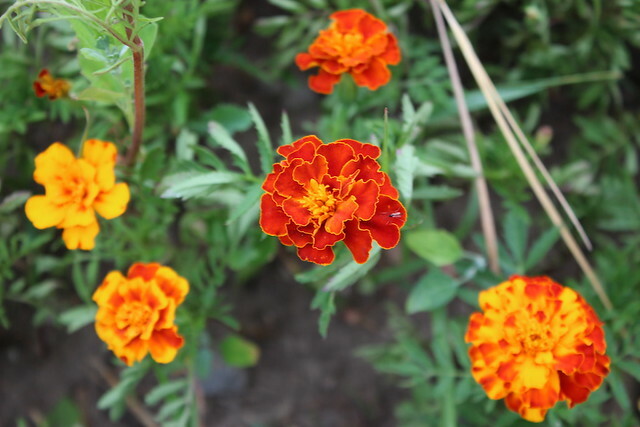 Plant native flowers around your vegetables to help attract and support the pollinators, and in turn they can help control crop pests as well! While pesticides can help you get rid of pests that are eating away at your garden, they can be potentially dangerous for pollinators. 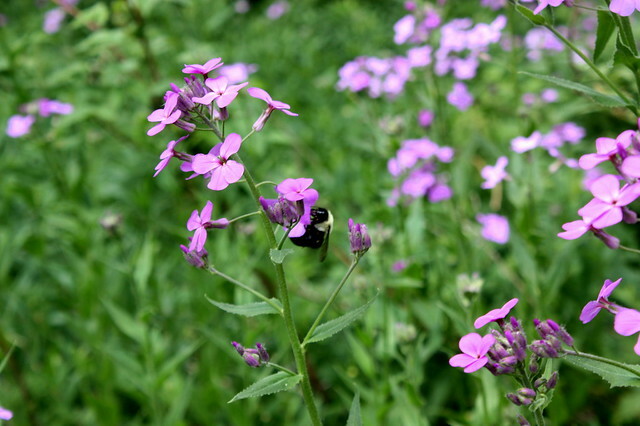 You can avoid harming the beneficial bees and butterflies by using natural pest control methods. To keep pest populations down, try planting a variety of plants. Infestations tend to get out of control when there is an abundance of one particular plant. Keep an eye out for early signs of pest damage to remove them before they become a problem. 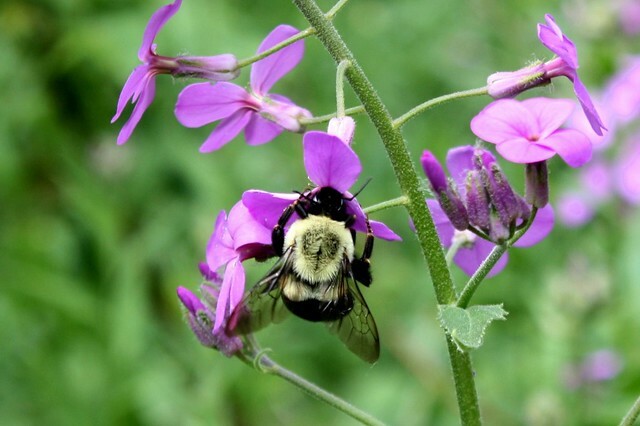 There are over 800+ native species of bees in Canada and most don’t form hives. The female bees lay their eggs in tunnels they create in sandy soil or decaying wood. 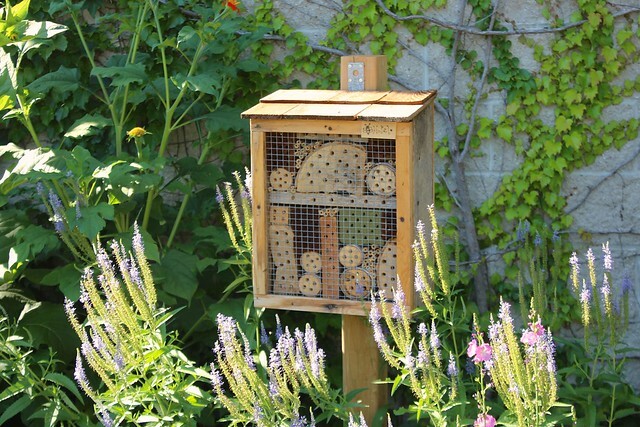 You can help them by building native bee houses! When we were in Creemore last month, they had one of these houses set up in their town park. I’m hoping to set up a couple of our own later this fall. If you have a dead tree that is still standing on your property, you can also drill holes of varying sizes to help them make a home. Talk to your town council, schools, churches and local businesses about planting a bee and butterfly garden in your community. From green rooftops to street-side planters, there is plenty of opportunity to share some space our friendly pollinators. 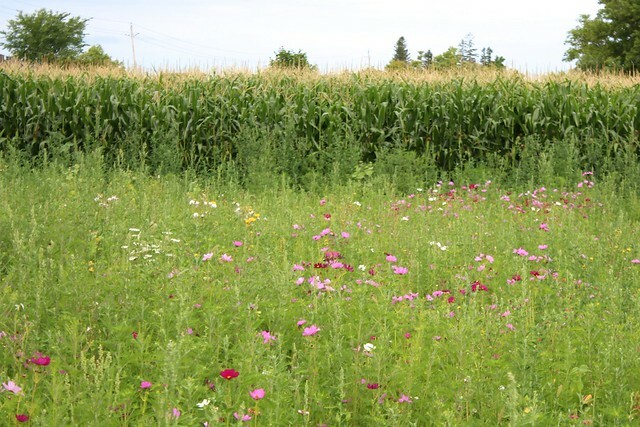 I hope these ideas will help you in creating your own pollinator-friendly community. If you have more suggestions, please share them in the comments below!